Great Britain & Ireland (GB&I) lost all four Walker Cup matches between 1947 and 1953 securing a disappointing total of 12 points in the process. It may therefore come as surprise to learn that one of our player’s achieved a record of P8 W6 L1 H1 during this same period. That player was Ronnie White. His loss and a half both coming in foursomes matches played with Joe Carr. All four of his singles were won. A name rarely mentioned by anyone nowadays White was arguably the best amateur golfer in the world in the initial post World War II period. Ronald James White was born on 9th April 1921 in Wallasey on The Wirral in England. When Ronnie was 5 he started accompanying his Dad, a member of Southport & Ainsdale GC, to golf, quickly picking up the game and it’s etiquette. Inevitably it wasn’t long before he started playing himself. Ronnie attended the Merchant Taylors’ school in Crosby and soon developed into one of the country’s leading Juniors. In 1936 he played in the Boys Amateur Championship held at Birkdale. the club he had joined aged 12 three years earlier. He lost 5&3 in the fourth round to William Innes of Lanark. Innes went on to lose the final 11&9 to the famous Irish player Jimmy Bruen. White fared better in 1937 when he won the U18 Boys’ Carris Trophy, in those days played exclusively at Moor Park, with rounds of 72 and 75. Fortunately for young Ronnie the Ryder Cup came to town in 1937 and he had the opportunity to see his hero Sam Snead up close. In an interview in 2001 he said “Snead was my role model. I was there for every moment of practice and competition, and was greatly impressed both by the way in which he and the other Americans played, and their style”. His golf continued to improve and between 1936 and 1938 he was selected for the English Boys Team for their annual match against Scotland. He captained the team in 1938. He played six games winning four, halving one and losing the other. Ronnie had just started a law degree when Great Britain entered World War II. He volunteered for the Royal Air Force and was first stationed, somewhat fortuitously, at RAF Leuchars for his initial 3 months of training. This enabled him to carry on practicing his golf at nearby St. Andrews. His intelligence and leadership skills saw him selected for flying instructor training. He qualified as a pilot at the British Flying Training School in Texas and appears to have seen out the War well away from the front line. Understandably very little competitive golf was played whilst the country was at War so just as White was coming into his peak years all of the major championships and events were cancelled (1940-45). The world was a different place after the war too with families devastated, food and petrol rationing in place and responsibilities altered. As Britain tried to rebuild itself as quickly as it could golf was certainly well down the list of most people’s priorities. White was demobilised in 1946 and moved back to the Birkdale area of Southport where he would stay for the rest of his life. Now aged 25 he re-commenced his law studies and qualified as a solicitor in London in 1949. After the 1946 season came to a close White set about remodeling his swing. “Experience had made me appreciate that if I were to achieve success my ambition must be consistency. The star players were all consistent”. He therefore set about gaining more knowledge, used photography and mirrors and practiced hard to create a ‘grooved’ swing. Whilst he never reached his unattainable aim of being as consistent as a golf ball testing machine he was to reap the benefits of this effort in the years that followed. Unusually at the time he also aimed to spend at least an hour a day on his physical and mental fitness, normally early in the morning. He would run along the shoreline at Birkdale as well as skip and weight lift at home. “Tired legs are the death knell of a competitive golfer, because when the legs get tired concentration lapses follow, and I was always determined to avoid this, particularly towards the end of a championship. I felt as good at the end of a 36-hole match or 72 holes over a weekend as I did at the beginning” he reflected in later life. He sought to manage his nerves by regularly practicing his breathing and by strengthening his stomach muscles. According to Leonard Crawley his mechanical approach enabled White to become “the most accurate hitter of a ball between tee and green since Henry Cotton” although he went on to say he was a “comparatively poor putter”. Surprisingly during his career White only played in two Amateur Championships, in 1946 and 1949. He lost in the fourth and fifth rounds respectively in close matches. He was perhaps a victim of his own success. In those days the Amateur was often scheduled around the Walker Cup (trials and match – in 1947, 1951 and 1955) or the Home Internationals (1948 and 1952). With a family to support he was simply unable to take extended leave from his studies and later work as a solicitor and thus sacrificed his own individual competition entries. Of course White was criticized by frustrated onlookers at the time for consistently missing our major amateur Championship. White did play in many other national events although many of these, certainly his victories, appear to have been in close proximity to home and work. In addition to his starring role in the Walker Cup it was his performance in these that secured his standing in the game. He won the Lancashire Amateur championship (1948 Birkdale), the English Amateur (1949 Formby), the Golf Illustrated Gold Vase (1949 Birkdale) and the Brabazon Trophy (the English Open Stroke Play title) in both 1950 (by 8 shots after rounds of 75, 72, 75 and 72 at Birkdale) and 1951 (by 4 shots after rounds of 77, 69, 73 and 74 at Formby). His 1951 Brabazon victory summed up his approach to golf. It was widely reported that both before and after each round White was seen rushing off to his office or to Wigan Magistrates’ Court. White also had some success in the Daily Telegraph Amateur-Professional Foursomes Tournament. He won it in both 1947 with Charlie Ward at Formby and in 1949 with Reg Horne at Moortown. “With a partner like Ronnie White, you just can’t lose” said Horne at the prize giving ceremony. He represented England in the Home Internationals of 1947-48-49-53-54 and in matches against France in 1947-48. After the 1953 Walker Cup White largely stopped playing competitively not that he was overly active beforehand. He was therefore surprised to be called up by England in 1954 for the international matches at Porthcawl. He performed well enough in Wales to merit a final selection for the 1955 Walker Cup match at St. Andrews. This proved controversial as White had declined an invitation to attend the pre-match trials. It was also a shame because he lost both matches and these failures took the edge of his superb overall Walker cup record. Playing first in both the foursomes and singles he came up against E. Harvie Ward in both, who had won the Amateur in 1952 and went on to win the US Amateur in both 1955 and 1956. Ward a full time amateur with a superb game simply had too much for White by then. White never played an international match again. White couldn’t resist a final outing when the Open Championship came to Birkdale in1961. Rounds of 71, 79, 80 and 76 were good enough for him to secure the low amateur Silver Medal in tied 38th place. He had previously only played in one other Open, at St. Andrews in 1946, where he finished tied 30th and fourth best amateur. One question I haven’t been able to answer concerns Ronnie’s club attachment. He joined Birkdale as a Junior, lived virtually opposite the course for most of his life and subsequently became an Honorary Member of this Club. Yet despite this all of his competition entries from 1947 onwards listed him as representing Royal Liverpool. 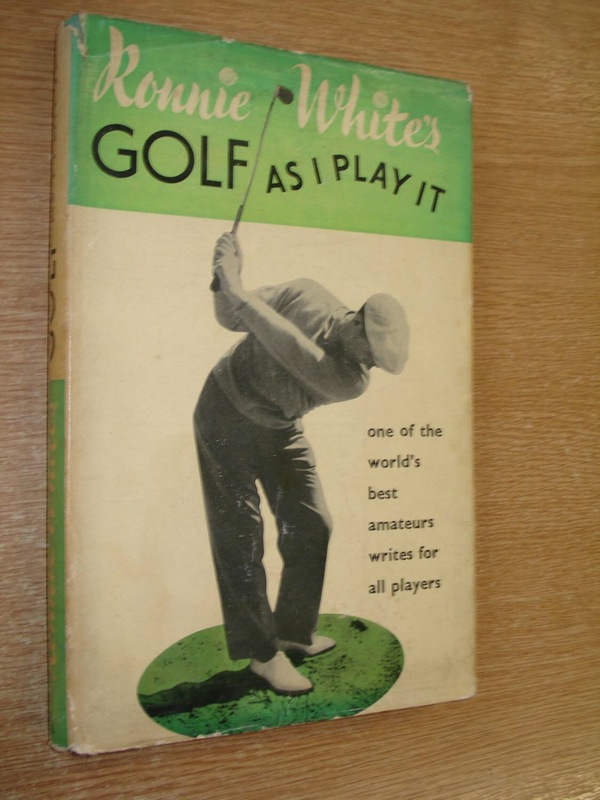 Even his book states ‘by Ronnie White, Royal Liverpool GC and the 117 photos were all clearly taken at Hoylake too. Matters are made more confusing when one looks through Royal Liverpool’s club histories and find’s not a single reference to Ronnie White. Ronnie won the R&A British Seniors in 1978 and 1979. He died in 2006 aged 85 to little fanfare in the golfing world. This is a shame because for a brief spell he was one of the best golfers in the world, a highly respected (true) amateur on both sides of The Atlantic. Given his approach to the game it was remarkable that he maintained his competitiveness for so long. Tom Scott on the 1949 Amateur Season: “The first national title, the English Amateur Championship (Formby April 25-30), went to R.J White, as we all expected it would. White played superlative golf and won the title with comparative ease by the margin of five and four. White’s victory was most comforting to all of us, for quite clearly he was at peak form, which meant he was the equal of any amateur in the world, British or American. Here was our No. 1 against the Americans and one who could be relied on to hold his own”. “Many of the highest authorities in American golf today are of opinion that he is the soundest British amateur of the last thirty years. That, of course, is just a matter of opinion, but since he is blessed with the three greatest attributes of a golfer – style, physique and temperament – he is unquestionably a tremendous player”- Leonard Crawley, A History of Golf In Britain (1952). “Charlie was the ideal partner for me to have, never a dull moment, always able to see the humour of life and yet a dogged competitor” recalled White in 2001. Fred Kammer was a semi-finalist in the US Amateur of 1946. Willie Turnesa was the 1938 and 1948 reigning US Amateur champion and runner-up in the Amateur championship; arguably the best player on either side. 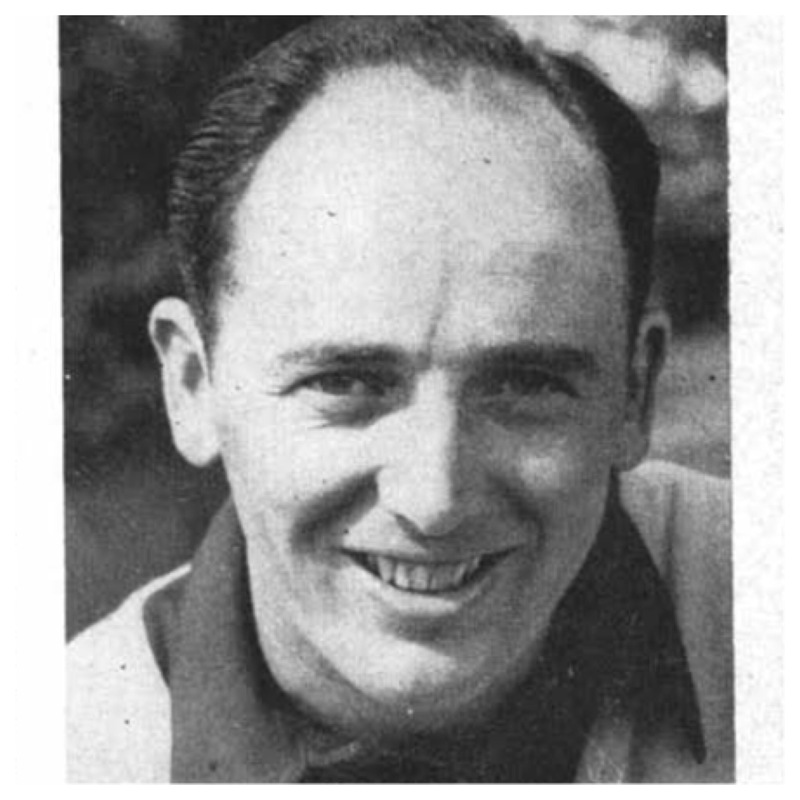 Henry Longhurst said “(The team) managed to get just two points – and without Ronnie White, whose form in the warm, windless conditions of American summer golf was so consistent that his team-mates christened him ‘One Height White’ (because every shot he hit, whatever the club, was the same height), we should assuredly have come home without a point at all”. “Everything about his game has the same professionally polished air – the safe and sound driving, the long iron shots that look as good as Cotton’s the immaculate short game, the confident putting. With half a dozen White’s we would have won that Walker Cup with the greatest ease”. Watching the Foursomes match with a crowd estimated at 10,000, GB&I 3Up and playing well, Bernard Darwin reported: “Poor Joe Carr had a bout of missing short putts and the holes melted away.” Nevertheless it took a 10-footer by Campbell at the last green to deny the GB&I pair a full point. In his singles White trailed 3 down after six holes against Charles Coe, but he rallied to win, 2 and 1. White still playing a restricted schedule gained selection in 1953 after reaching the English Amateur final in 1953, a match he surprisingly lost at Birkdale to teammate Gerald Micklem. “When Carr and White are a little older it will dawn on them that young successful partnerships are apt to wear out” wrote Leonard Crawley in 1954 having watched them struggle on Day 1. The opposition was tough though; Sam Urzetta was the 1950 US Amateur champion and Ken Venturi went on to win the 1964 US Open. In the foursomes Carr and White were 1Up with three holes to play. On the 34th hole they three putted whilst Cherry chipped in from off the green. More poor play around the Road Hole green cost the GB&I pair before the last was halved. Both players were gutted and criticised heavily in the press. It was no surprise then that they both lost their Single matches heavily the following day. E. Harvie Ward went on to play in two further matches and finished with a 100% win record from his 6 games played. “For most of the week, White’s golf was very poor, and until he faced John Morgan in the Welsh match, he was but a shadow of the great player we know him to be” wrote Crawley. 1946 Birkdale – 4th Rd lost to Frank Stranahan by 1hole. “The round between RJ White and FR Stranahan took three hours and forty minutes which is farcical and monstrous. Golf is not a funeral, although both can be sad things” – Bernard Darwin. Stranhan has the best Amateur Championship record of any player winning 43 of his 50 matches between 1946-54. He won the Amateur in 1948 and 1950 and was runner up in 1952. 1949 Portmarnock – 5th Rd lost to Ernest Millward by 1 hole. In the 2nd Rd White beat Dr. W Twedell 3&2 and in the 3rd Rd PB ‘Laddie’ Lucas on the 20th hole. Millward won the English Amateur Championship in 1952. 1961 Birkdale – 71 79 80 76 (T38) – Silver Medal winner for leading amateur.